This year I decided I really wanted to take a class or two on topics that normally I wouldn’t be drawn towards. In the past this usually meant something to do with turning, carving a linenfold or leaf and especially nothing to do with hand-hewing a log. It’s not that I don’t think they’re worthwhile topics, it’s just up until now my interests at Woodworking in America have been more about bench tools or projects that I see myself doing as soon as I got back to my shop. You know…topics I’m kind of familiar with already. But this year I obviously threw all that out the window! It’s pretty safe to say that the majority of my classes went against the grain of normalcy for me. And I can honestly say it was worth it! For today’s video it’s a visit to Peter Follansbee’s “Carved Spoons”. 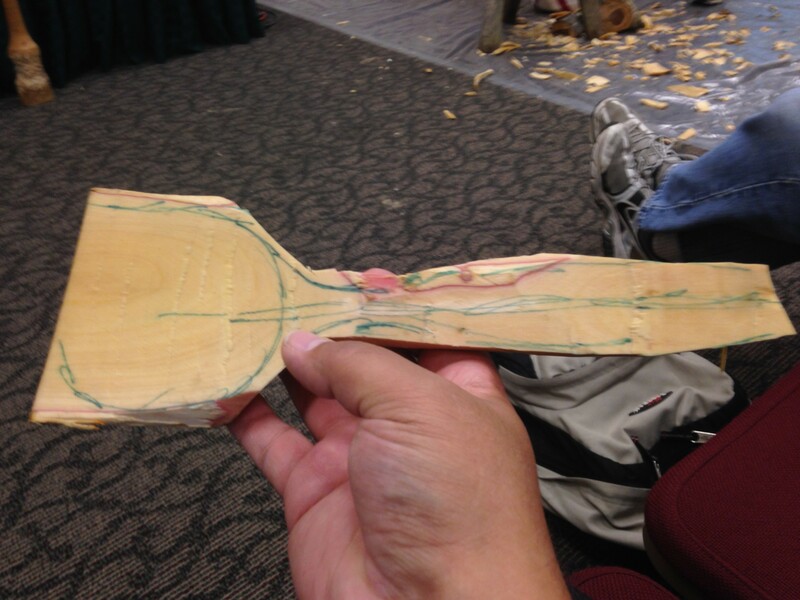 I have no idea when I’ll ever carve my own spoon(s), but after only about 30 minutes of watching Peter split a log, then shape it into a spoonlike blank, I was hooked. Unfortunately I didn’t make it all the way through the class, so I don’t have the finished spoon footage to share (it was lunchtime and someone else was buying that day…), but I think you’ll quite easily get an idea of what a great class this was. Thanks Peter for keeping me entertained and actually sparking an interest in me for something I still can’t believe I’m looking forward to trying sometime in the near future. To learn more about Peter and to checkout all the things he has going on that might be something you’ll be looking forward to trying out too, visit his blog at pfollansbee.wordpress.com.